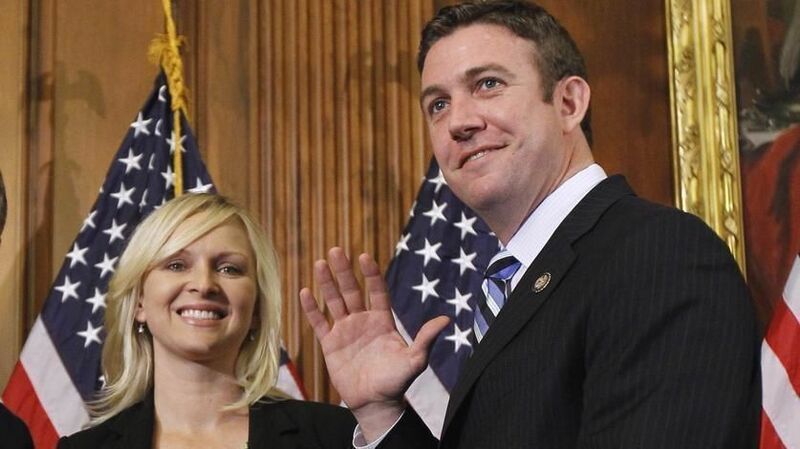 What a chump and a coward, but then does anyone expect any more or less from anti-gay creep Duncan Hunter, the second Republican in Congress, after the now indicted corrupt Chris Collins, to endorse Trumputin!? “I didn’t do it” and “There was money spent” are weasel words! Now there a real man. Tosses his wife under the bus. I see a divorce in someone’s future. Amazing, he sits on congressional committees with massive budgets but claims he’s not aware of his personal finances. Claims to be a expert when guiding our countries finances and is a moral pillar of government. Well, convicted Governor McDonnell of Virginia also played the wife blame. It didn’t work. A crook is a crook. He certainly learned from Trump. Blame anyone and everyone else. Anti-gay… waiting for the men he most likely hooks up with to come out of the woodwork. This is a man who is the poster child for entitled privileged existences, having literally inherited his seat from his father. This man is a representative, and I don’t believe for a second he even thinks about the needs of the people he represents. Not even a little. Well, let’s hope this prick gets what’s coming to him. Seems like he needed money though. A lot of people have debts that they’re having trouble paying off hopefully they know how to dump debt collectors make them be the ones to pay! The hubby and I just flew a military hop from Norfolk VA to Naples Italy and back again all at taxpayers expense. One of the benefits of spending 20 years in the military! Typical Republican, Steals taxpayer money, and never takes responsibility for anything they do.